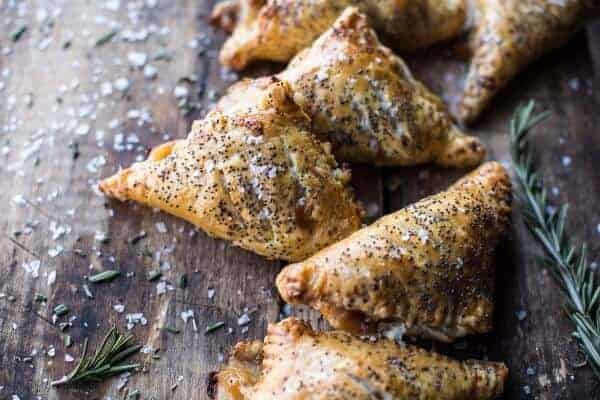 Caramelized Pineapple, Ham and Cheese Turnovers. 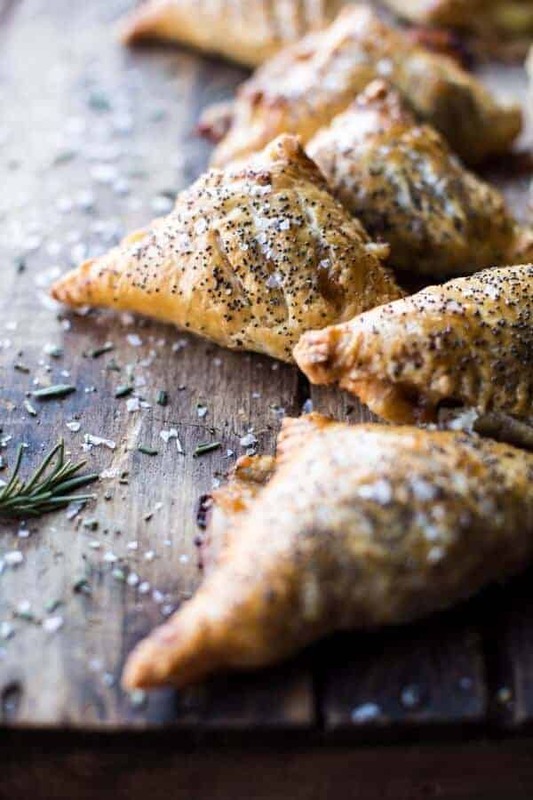 I know, bold statement, but seriously these cute little turnovers are to die for. Sweet, cheesy, savory, buttery… just all kinds of deliciousness. I think the combo of caramelized pineapple, swiss cheese and puff pastry is just maybe the best thing ever. Everyone, and I really mean EVERYONE, was into these. Someone even said they’d be really nice just to have around to snack on. I agree, they’re perfect for snacking, or to eat as a lite meal. I like them best as an appetizer, but all three will work. For someone who never used to be a ham person, I’ve really gotten into it in the last year. I know that a lot of people really love ham, but growing up it was rarely ever presented to me so I just assumed I didn’t like it. That all changed last year though when I finally made my first ham (please excuse the ugly photos, ham is not a very pretty subject). I mean, whoa! So much yummy flavor. I loved it, the family loved it… we are slowly but surely becoming ham people. Anyway, I baked a ham the other week and had so many leftovers (possibly the best part about baking a ham is the leftovers) that I decided I needed to make a fun appetizer out of them. Clearly pineapple and cheese needed to be involved, and since I’m on a puff pastry kick, well I couldn’t think of a better way to hold this all together. And that is how these cute little turnovers were made. Honestly, these triangles are heaven. Simple, delicious heaven. I know that’s pretty dramatic, but it’s true. Speaking of heaven, I have some extremely sad news regarding the family chickens. Sadly nine of our eleven chickens were attacked by two foxes last night and they did not make it. I never thought I could be so sad about chickens, but you guys, it’s REALLY sad. Not only that their lives are gone just like that, but dad finally had them laying eggs and doing all the right things (he was having some issues with the chickens eating the eggs and brooding). As much as the chickens grossed me out, they had become a part of the family and now they are just gone. It’s just so sad. The two chickens left are from our original light-colored Buff Orpington chicks. They are so traumatized they will not leave their house. We are not 100% sure as to how the foxes got into the coop, but we have decided we are getting a full on house with a roof and a door that locks for them to go into at night. Then there will be no way for any predators to get them. It’s Colorado, in the mountains, so we knew this was a possibility, BUT my dad had them in a pretty safe coop. Unfortunately it was just a super snowy night and the foxes must have climbed in and broken into the one house housing nine of the chickens. I woke up and saw them out there eating the chickens. That was not fun. Okay, sorry for all the sadness. 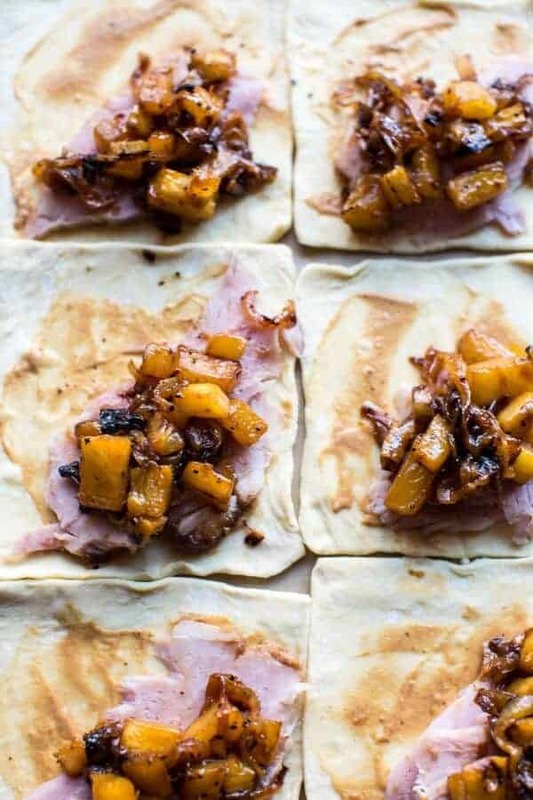 Let’s try to put our focus back on these Caramelized Pineapple, Ham and Cheese Turnovers. Honestly, you guys HAVE to make these this holiday season, or really any season. Just make them! 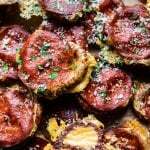 They are easy, you can even prepare them in advance and bake them just before serving. AND they are hand-held which makes eating them a breeze. Trust me on this, you guys really have to make these. Plus, they’re cute, and we all know that cute food is always fun and yummy! Oh and I almost forget to tell you, there are also caramelized onions. YESSS. Life is complete! Heat a large skillet over medium-high heat and add the butter. Add the onions and cook about 10 minutes, stirring frequently, until softened. At this point you want to slowly add the pineapple chunks and the pineapple juice, a little at a time, letting everything cook into the onions. Slowly add more until until you've added all the pineapple chunks and juice. Cook until the onions are caramelized to your liking and the pineapple juice has evaporated. Remove from the heat. Roll out the puff pastry sheets and cut each sheet into 9 squares (18 squares total). Place squares on a piece of wax paper or parchment paper (this will prevent sticking). In a small bowl, whisk together the mustard and worcestershire sauce. Brush the mustard mix lightly on each square of puff pastry. Divide the onion/pineapple mixture among the 18 squares, top with ham and swiss cheese. Don't overfill, otherwise it will be very difficult to seal the edges. Brush egg wash around the perimeter of each pastry square and carefully fold dough over filling to create triangles. Pinch the edges closed to create a good seal. 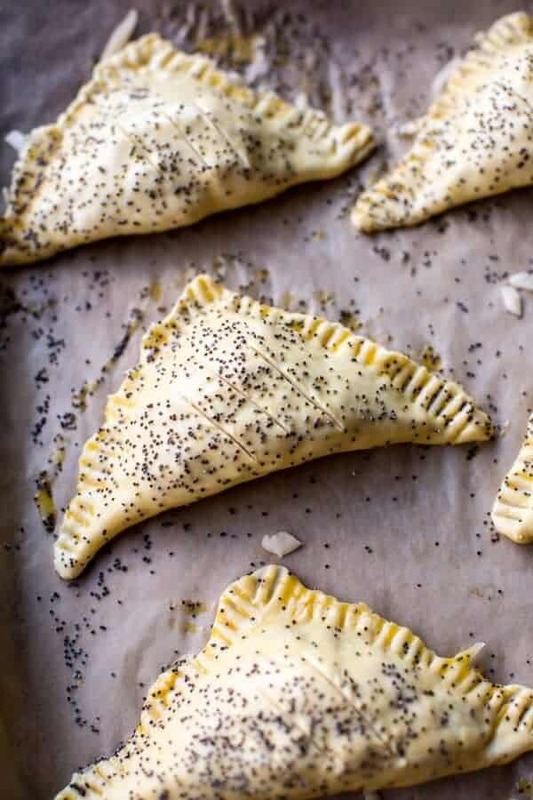 Generously brush the top of each turnover with egg wash, sprinkle with poppy seeds. Place on a parchment paper lined baking sheet. Bake for 15 to 20 minutes or until lightly golden. 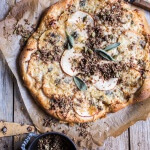 Serve immediately with a sprinkle of chopped fresh thyme and flaky sea salt. P.S. Christmas Eve is in just ONE week. WHOA. Time to start planning your appetizers. 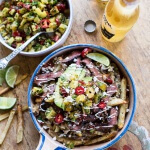 Hawaiian Carne Asada Fries with Pineapple Pico De Gallo. 3 Ingredient Cheesy Pizza Pretzels. oooh, caramelized pineapple jam/compote sounds amazing! i bet it’d be great on pizza and grilled cheese and sandwiches and toast and chicken and i could go on for days…. and i’m sorry to hear about your chickens! ): hopefully they’re in chicken heaven roaming and eating to their hearts’ content. I don’t really make any of your recipes since our style of cooking is different (though I should try a few). But I must say that you come up with some amazing combinations that put most restaurants to shame. And your photos are always amazing. I just get a little frustrated when I think my recipes won’t taste as good as HBH’S. But then I think, no they will taste as good, they just won’t look as good. You have won my heart with those poppy seeds on top. And even I, non food blogger that I am knows the power of pineapple & ham. These are going on my appetizer holiday board that I have right now going as a giveaway, and I am going to impress even my mom!!!!! LOL! Looks don’t mater, it is all about taste anyway…but I am sure yours will look great too! Thanks Laura! 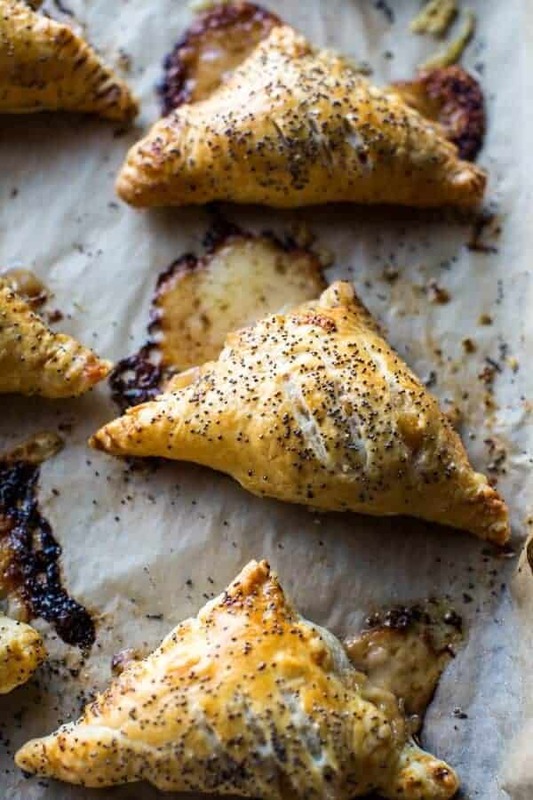 Ah no, I have to draw the line on savoury with pineapple, sadly it does not work for me… must find another turnover recipe that will do the trick for me… I’m thinking mushrooms!! 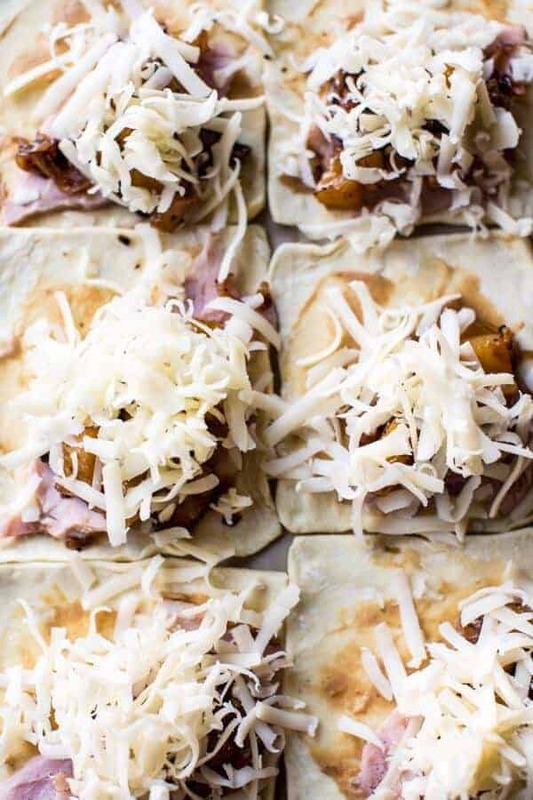 Ham, pineapple and cheese are one of the best combinations ever! Oh no! I am so sorry! It is truly the worst! Yum – thank you and Happy Holidays to you and your family. Aww, I am so sorry to hear about the chickens. That is so so sad. 🙁 🙁 🙁 . What a traumatic experience. On a happy note though, totally making these for a New Years Eve party we’re going to! Thank you for always having such creative new dishes that make me look good to all of my friends, lol! My husband would love these. Sorry about your chickens. So sad to try and have something then wild animals destroy. These look so good!! I am so sorry to hear about your dads chickens, that’s so sad! I always worry about that where I live because I have Yorkies and they are so small and could never defend themselves ☹ We have seen fox running through our yard a few times, they are beautiful but not when they want to eat our pets! The other coop sounds perfect to keep them out, that’s a great idea! Sorry about your chickens :(. Thank-you for the recipe though, it looks delicious. I love this combination of flavours. I wonder if this would be too fancy for the superbowl ;). Eh who cares if it is :P.
Definitely going to make these with leftover ham from Christmas dinner. Thank you!! Whoa. Ham/pineapple scream “Easter” to me but I might just have to try them out for Christmas! (Also maybe with a side of marinara as ‘Hawaiian pizza puffs’ for game day apps?!) What is you preferred brand of puff pastry? These sound and look amazing I am going to try them out this Sunday and bring to a friends for a holiday get-together! I am so very sorry for the poor chickens that didn’t make it, very sad news for your family!!! Do you have a recipe for making your own puff pastry? Oh, Tieghan, I am so sorry to hear about your/your dad’s chickens! My mother has quite a few here on the farm (she sells free-range, organic eggs in a number of local stores), and we have been having a problem recently with some of them being taken too, though we don’t know by what yet (though at this time we are suspecting a large bird of prey). Over the years, my mother has had to implement all sorts of protection plans for them, as if it is not a hawk, it’s coyotes, and if it’s not coyotes, it’s owls, and if it’s not owls, it’s a winter-starved bobcat (!). We have had all sorts of threats. We do not have foxes where we are currently, although I am sure that is something that my mother had to deal with when we lived closer to the coast/US border of BC. I will ask her if she has any tips on the protection front. Poor little biddies. 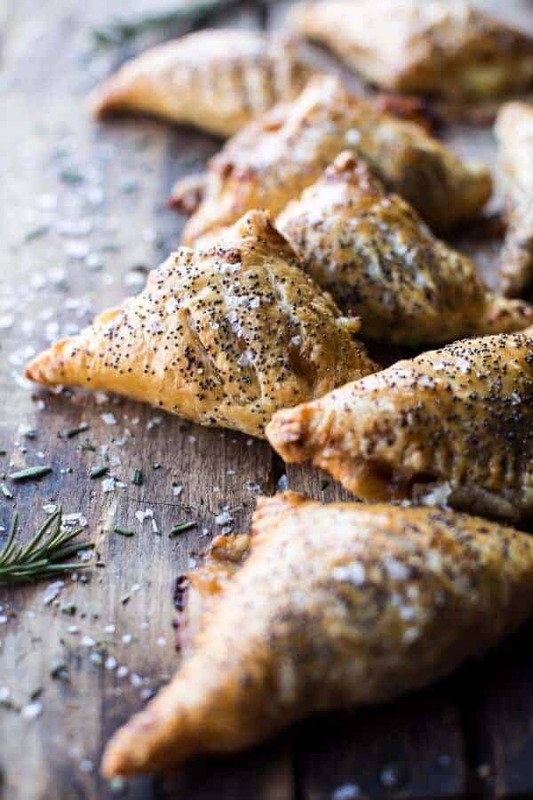 On the food front, these turnovers look divine. I do so love pineapple. I am with you on the ham, however; I too have only started to come around to it this year. I am still not very partial to it as just a big slab on the plate (I am always disappointed if ham is the main attraction at a holiday dinner — more scalloped potatoes please! ), but I have begun to incorporate it into other dishes, and that is where the WIN is for me. Only yesterday, I made a grilled ham, cheddar, and red onion sandwich with top quality local Dijon mustard for lunch, and it was divine. These are definitely going on the list of holiday dishes to make (dear me, the list is getting incredibly long). Oh I’m so sorry to hear about your chickens!! Weekends I’m volunteering at a farm animal sanctuary and I know how sweet and crazy and amazing chickens are and how sad it is when one of them dies. It’s terrible that you had to burry 9 at the same time. 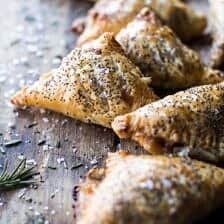 These little turnovers look so delicious. 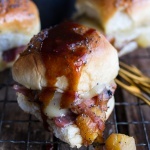 I’ve never been a big ham person, but these photos are making me drool! I’m so sorry about your chickens! I grew up in a somewhat rural area with chickens and we had some scary late night attacks too. It’s so heartbreaking, even though they’re just chickens, they sort of become part of your family and life. I had names for all 30+ chickens at one point. 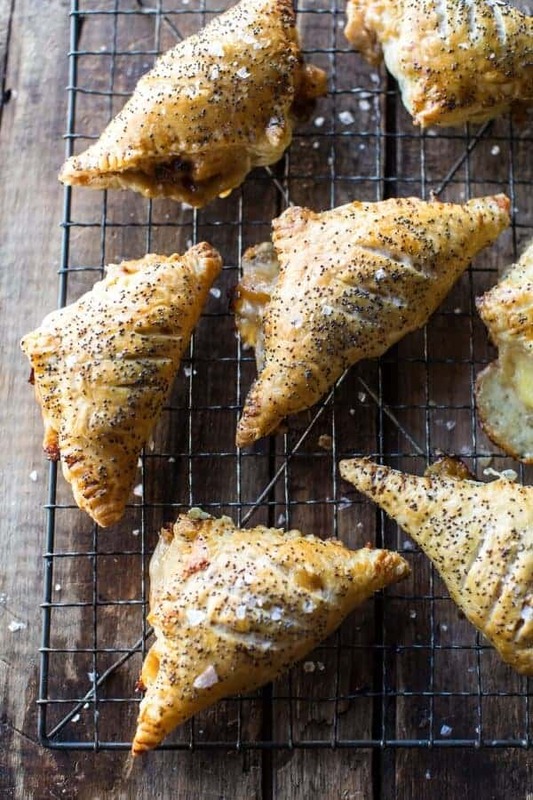 Ummm…these turnovers look amazing. I’m always a fan of the ham and pineapple combo. 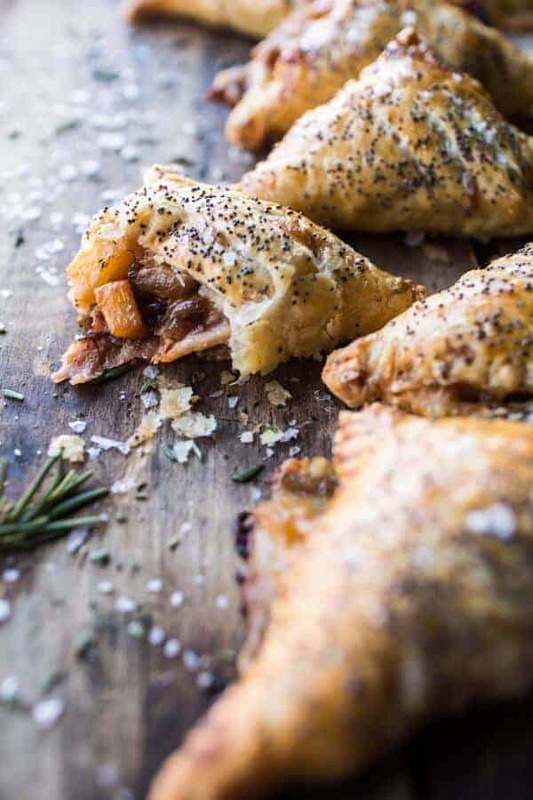 Plus, anything with puff pastry is mouthwatering to begin with! That is horrible, so sorry to hear about your chickens:(. To those amazing turnovers, I definitely will take your word for it. They look and sound absolutely delicious. Something about caramalizing pineapples that brings the best in them. Awesome. apps to dinner! Pictures are gorgeous Tieghan! Wonderful idea, like a Hawaiian pizza to go. Love it. I’m really looking forward to making these! But I was hoping to make them ahead of time and freezing them for my mom. What would be the best method for freezing them? And how should they be baked if frozen? Should they thaw first? Hey Page! I would freeze these uncooked on a baking sheet in a single layer and then transfer to a freezer safe bag. I would bake them frozen for maybe 5-8 minutes longer than directed in the recipe. Let me know if you have any other questions. Hope you love these! Happy 2016! Do you have any ideas for a gluten free crust for these? Hi, I am sorry I am not very familiar with gf cooking, so I am not sure. So sorry!